This event "Baum Haus Special - Josie Long : Cara Josephine Tour" @ Griessmuehle has already ended on 10/08/2015. Here you can find upcoming events for this location! The three-time Edinburgh Comedy Award nominee and cult optimist is back with her most personal show to date - about love and being outdoorsy as a bear. Josie is the star of Radio Four’s All Of The Planet’s Wonders and Short Cuts, and a regular contributor to The Guardian Guide. She’s recently appeared on BBC1’s Have I Got News For You, Channel Four’s 8 Out Of 10 Cats, Comedy Central’s Alternative Comedy Experience, Radio 4’s Just A Minute and many more. 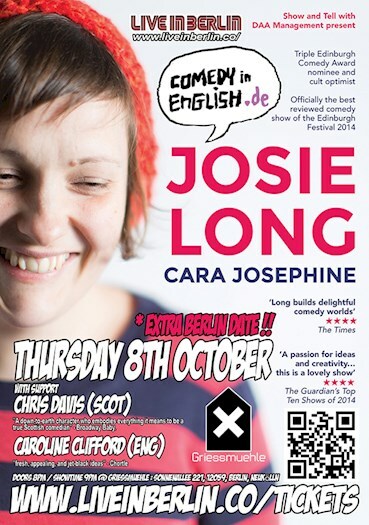 Cara Josephine was the overall best-reviewed comedy show at the Edinburgh Festival Fringe 2014 – according to independent analysis. Chris Davis is a comedian from Glasgow, Scotland. He is a regular performer in the Berlin English comedy scene. He has performed in New York, London, and Belgium, of all places! He performed at the Edinburgh Fringe Festival in 2012 and 2013. In 2013, he was a finalist in The Scottish Comedian of the Year. In 2014 he took his show to the Glasgow International Comedy Festival and will do the same in March 2015. He enjoys olives. But never used to. "A down-to-earth character who embodies everything it means to be a true Scottish comedian" - Broadway Baby. "Davis is entertainment with a capital E!" - one4review. Caroline Clifford is from England where she reached the final of the prestigious So You Think You're Funny?, Amused Moose Comedy and Funny Women competitions. She now lives in Berlin where she co-hosts the incredibly popular We Are Not Gemüsed comedy show and is one of the most popular headliners in town. She is known for her fast wit, dark, surreal and imaginative sense of humor. "One of the best new comics to come along for a long time" - Logan Murray, author: "Be a great stand-up"